TH E M R EP O RT | 61 O R I G I NAT I O N S E R V I C I N G A NA LY T I C S S E C O N DA R Y M A R K E T SECONDARY MARKET THE LATEST Fannie Mae & Freddie Mac CEOs Salaries Capped at $600,000 The U.S. House of Representatives passed S. 2036 by voice vote in November, placing a cap on the salaries of the GSEs' CEOs. F annie Mae and Fred- die Mac CEOs will not be receiving the multi- million dollar pay raises proposed by their conservator, the Federal Housing Finance Agency (FHFA), earlier this year. 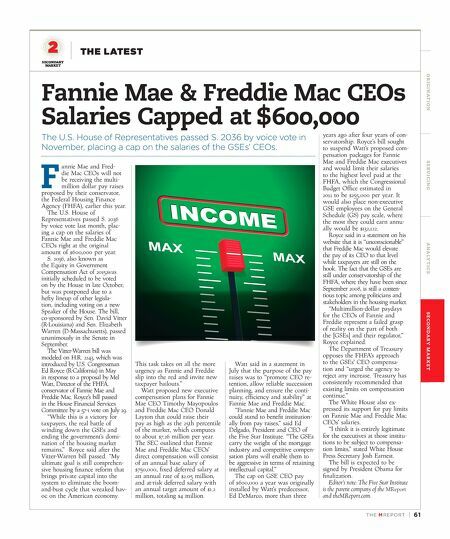 The U.S. House of Representatives passed S. 2036 by voice vote last month, plac- ing a cap on the salaries of Fannie Mae and Freddie Mac CEOs right at the original amount of $600,000 per year. S. 2036, also known as the Equity in Government Compensation Act of 2015,was initially scheduled to be voted on by the House in late October, but was postponed due to a hefty lineup of other legisla - tion, including voting on a new Speaker of the House. The bill, co-sponsored by Sen. David Vitter (R-Louisiana) and Sen. Elizabeth Warren (D-Massachusetts), passed unanimously in the Senate in September. The Vitter-Warren bill was modeled on H.R. 2243, which was introduced by U.S. Congressman Ed Royce (R-California) in May in response to a proposal by Mel Watt, Director of the FHFA. conservator of Fannie Mae and Freddie Mac. Royce's bill passed in the House Financial Services Committee by a 57-1 vote on July 29. "While this is a victory for taxpayers, the real battle of winding down the GSEs and ending the government's domi - nation of the housing market remains," Royce said after the Vitter-Warren bill passed. "My ultimate goal is still comprehen- sive housing finance reform that brings private capital into the system to eliminate the boom- and-bust cycle that wreaked hav- oc on the American economy. This task takes on all the more urgency as Fannie and Freddie slip into the red and invite new taxpayer bailouts." Watt proposed new executive compensation plans for Fannie Mae CEO Timothy Mayopoulos and Freddie Mac CEO Donald Layton that could raise their pay as high as the 25th percentile of the market, which computes to about $7.26 million per year. 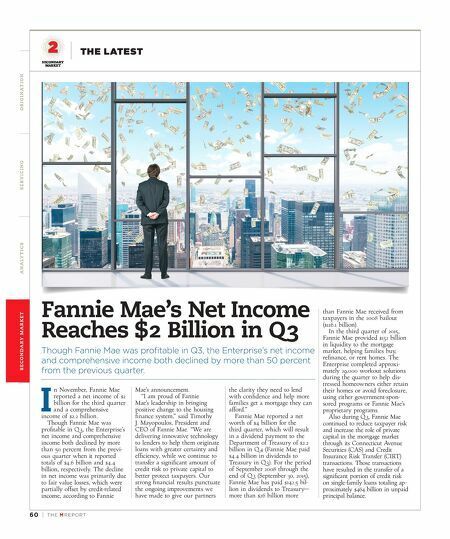 The SEC outlined that Fannie Mae and Freddie Mac CEOs' direct compensation will consist of an annual base salary of $750,000, fixed deferred salary at an annual rate of $2.05 million, and at-risk deferred salary with an annual target amount of $1.2 million, totaling $4 million. Watt said in a statement in July that the purpose of the pay raises was to "promote CEO re - tention, allow reliable succession planning, and ensure the conti- nuity, efficiency and stability" at Fannie Mae and Freddie Mac. "Fannie Mae and Freddie Mac could stand to benefit institution- ally from pay raises," said Ed Delgado, President and CEO of the Five Star Institute. "The GSEs carry the weight of the mortgage industry and competitive compen- sation plans will enable them to be aggressive in terms of retaining intellectual capital." The cap on GSE CEO pay of $600,000 a year was originally installed by Watt's predecessor, Ed DeMarco, more than three years ago after four years of con - servatorship. Royce's bill sought to suspend Watt's proposed com- pensation packages for Fannie Mae and Freddie Mac executives and would limit their salaries to the highest level paid at the FHFA, which the Congressional Budget Office estimated in 2011 to be $255,000 per year. It would also place non-executive GSE employees on the General Schedule (GS) pay scale, where the most they could earn annu- ally would be $132,122. Royce said in a statement on his website that it is "unconscionable" that Freddie Mac would elevate the pay of its CEO to that level while taxpayers are still on the hook. The fact that the GSEs are still under conservatorship of the FHFA, where they have been since September 2008, is still a conten- tious topic among politicians and stakeholders in the housing market. "Multimillion-dollar paydays for the CEOs of Fannie and Freddie represent a failed grasp of reality on the part of both the [GSEs] and their regulator," Royce explained. The Department of Treasury opposes the FHFA's approach to the GSEs' CEO compensa- tion and "urged the agency to reject any increase. Treasury has consistently recommended that existing limits on compensation continue." The White House also ex- pressed its support for pay limits on Fannie Mae and Freddie Mac CEOs' salaries. "I think it is entirely legitimate for the executives at those institu- tions to be subject to compensa- tion limits," stated White House Press Secretary Josh Earnest. The bill is expected to be signed by President Obama for finalization. Editor's note: The Five Star Institute is the parent company of the MReport and theMReport.com.